Studied acting at the Janáček Academy of Music and Performing Arts in Brno. 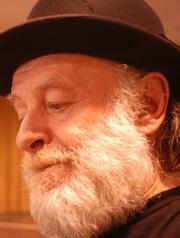 In 1967, he started his engagement at the Večerní Brno Theatre; in 1970 he joined the Slovácké divadlo (Slovácko Theatre) in Uherské Hradiště, and since the year 1972 he has been a notable personality at the theatre Divadlo na provázku (Husa na provázku – Goose on a String). His one-man theatre is also well known with its performance Nejsem svůj pes – I am not my dog. He also took part in the films Balada pro banditu – Ballad for the Bandit , Šašek a královna – The Clown and the Queen, Lotrando and Zubejda, Zapomenuté světlo – Forgotten Light, Stůj nebo se netrefím – Stand Still or I Won’t Hit, Pupendo and others. At Brno City Theatre, he played the role of Estragon in Beckett’s Waiting for Godot, and he also acts in Zdeněk Černín’s Sbohem, lásko – Goodbye, Love.